After fleeing Fort Ticonderoga, and then Whitehall, the Rebels continue their escape to Fort Ann. This bronze plaque in the rock face of Battle Hill was placed during the 150th anniversary celebration in 1927. View of Battle Hill. Courtesy of Dr. Michael Jacobson, Battle of Fort Ann Historic Resource Survey. After the American Rebels fled Whitehall on July 7, British Colonel John Hill and 190 soldiers of the 9th Foot followed in close pursuit. Rebel Captain James Gray of the New Hampshire militia was posted at Fort Ann and ordered his men to size up the British force coming their way and to protect the retreating Rebels. About noon, the two opposing troops met each other about half a mile north of the fort. Outnumbered, Hill withdrew and settled in for the night. After being informed of Hill’s inferior numbers from an American who had managed to infiltrate the British camp, Rebel Colonel Pierce Long launched an attack on the morning of July 8, 1777. 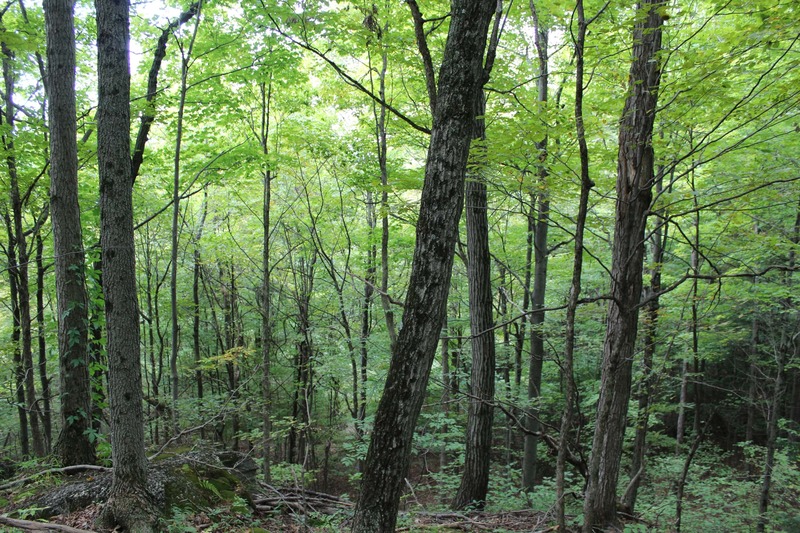 Bolstered by several hundred militias under the command of Colonel Van Rensselaer, Long drove Hill’s troops back through dense woods and over rocky knolls to a defensive position atop a ridge. For two hours the British held off Long’s increasingly effective fire. With ammunition running out, Hill was on the verge of surrendering when an Indian war whoop echoed through the forest. As a result, Colonel Long reluctantly pulled back to Fort Ann. Hearing the Indian’s war call, he feared the imminent arrival of British and Indian reinforcements. What he did not know was that he had fallen victim to the cunning of a single British officer successfully imitating the Indian battle cry. With information provided back at Fort Ann by a prisoner freed in the attack, Colonel Long did learn that a legitimate and sizable British relief force was expected soon. Given that knowledge, the soldiers at Fort Ann packed up, burned the fort, and made their way 14 miles to relative safety of Fort Edward. The spirited action had resulted effectively in a draw. The American Rebels failed to take the ridge-top position of the British, but they gave a good account of themselves, despite losing the flags of the 2nd New Hampshire Regiment. They rescued a number of prisoners and escaped with few casualties to Fort Edward to fight another day. The British under Colonel Hill claimed victory as their own. They had driven the enemy from the field in a heroic action against a foe many times their number. Driving south on Route 4 out of Whitehall, you’ll see Wood Creek and the Champlain Canal to the left. When the Champlain Canal was constructed between 1817 and 1823, engineers used the creek as a water route between Fort Edward and Whitehall. They deepened and straightened the waterway, expanding it over several generations. The landscape today is very different than it was in 1777. Fish Creek was shallower and the surrounding landscape a marshy lowland. Rock cuts were made to the surrounding rock walls to make way for the railway and roadways. 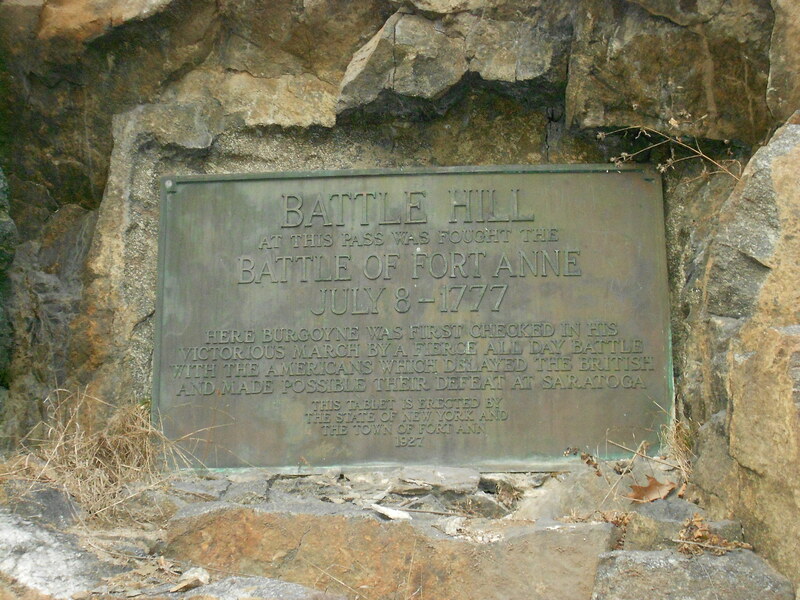 As you travel south toward the village of Fort Ann, you will see a plaque identifying Battle Hill. However, this is not a safe place to stop. The roadway through this area is 55 MPH and the shoulder is very narrow. It is safest to drive south to the Fort Ann Pocket Park to stop. Start Track 17 after leaving Whitehall. Battle Hill Brewery. Battle Hill Brewing produces craft beers, including a War Whoop IPA and a cocoa porter—and homemade chips and other lunch and dinner options. Try the grass-fed burger. 4 Charles Street, Fort Ann. Fort Ann Super Stop. This unsuspecting truck stop has a great deli, serving breakfast sandwiches and a variety of hot and cold dishes, including salads, soups, pizza, and deserts. 11300 NY-149, Fort Ann. “On the same day (July 7) the Country people about Skenesborough having reported that part of the Enemy were still retreating upon Wood Creek, the 9th regiment was detached to take post near Fort Anne to observe their motions. This was effected tho’ with much difficulty, the roads being extremely bad and the Bridges broken. The other troops were employed all that day and night in dragging fifty bateaux over the falls to facilitate the movement of the rest of the first brigade to dislodge the enemy there.” –General John Burgoyne, July 7, 1777. ‘A violet storm of rain which lasted the whole day prevented these troops from getting to Fort Anne so soon as was intended; but the delay gave the 9th regiment an opportunity of distinguishing themselves by standing and repulsing an attack of six times their number. The enemy finding the position not to be forced in Front endeavored to surround it, and from the superiority of their numbers that inconvenience was to be apprehended and Lt. Col. Hill therefore found it necessary to change his ground in the heat of action. So critical of an order was executed by the regiment with the greatest steadiness and bravery. The enemy after an attack of three hours were totally repulsed with great loss. They fled toward Fort Edward setting fire to Fort Anne, but leaving a saw-mill and blockhouse in good repair which latter was afterwards possessed by the King’s troops. The 9th regiment acquired during their expedition about thirty Prisoners, some stores and Baggage and the Colours of the second Hampshire Regiment.” —General John Burgoyne, July 8, 1777.